How cool are these, not a melon and not a cucumber but a cucamelon. One of the highlights of James Wongs new book "Home Grown Revolution". An heirloom that packs a lot of flavor in an adorable, teaspoon-sized treat! These little charmers are like no other, packing a powerful, sweet, cucumber flavor with a tangy, citrus twist. Delicate foliage and fist-fulls of fruit that look like doll-sized watermelons make these plants pretty enough to grow trellised in a flower garden or cascading in a hanging basket. 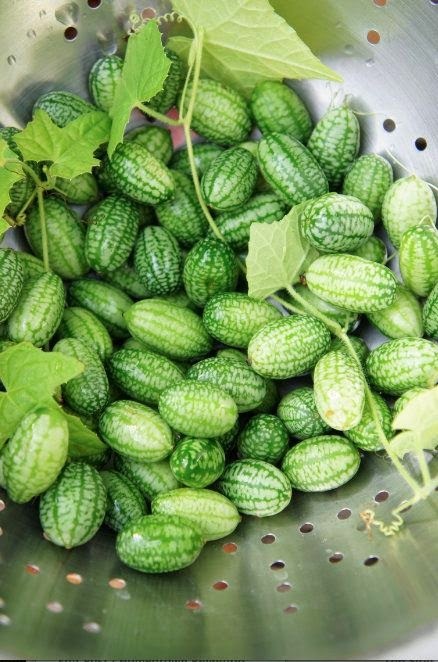 They are very small, just an inch and a half tall, light-green fruits with darker mottling look like watermelons for a doll house, which gives them one of their common names, mouse melon. The scientific name of this plant is Melothria scabra and it comes from Central America. The flesh is white, crisp, crunchy with a slight lemony tartness. The flavour is closer to a cucumber than a melon with a dash of lemony zest thrown in for good measure.